The 2012-2018 FAMOS meeting materials are available here. The Forum for Arctic Ocean Modeling and Observational Synthesis (FAMOS) is an international effort to focus on enhancing collaboration and coordination among arctic marine and sea ice modelers, theoreticians and observationalists based on a set of activities starting from generating hypotheses, to planning research included both observations and modeling, and to finalizing analyses synthesizing major results from the field studies and coordinated numerical experiments. FAMOS project is motivated by and a logical continuation of more than 10-years of AOMIP (Arctic Ocean Model Intercomparison Project, www.whoi.edu/projects/AOMIP) work demonstrating that that the arctic marine science community needs an informal forum to discuss, coordinate, plan and synthesize scientific activities. The AOMIP approach has been to leverage the existing financial support of each project participant for a comparative analysis of different models and scientific results. This approach has provided a unique opportunity to coordinate studies nationally and internationally via a set of carefully-planned numerical experiments covering the most important processes and interactions. A clear advantage is that each participant is able to work with her/his specific research theme using simulation results from more than a single model and to analyze differences and test hypotheses using a multi-model suite of outputs. 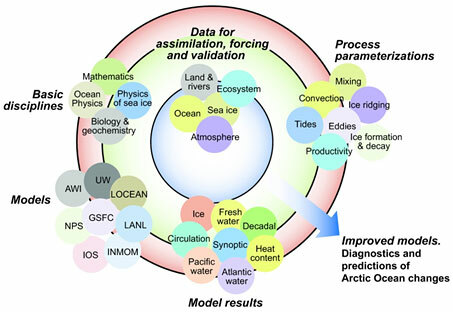 The result is a synthesis that integrates observational and modeling efforts toward the overall goal of developing advanced Arctic models able to accurately reconstruct past, describe current, and predict future Arctic conditions. In this regard, FAMOS’s approach will be similar AOMIP’s one and we view FAMOS as a “collaboratory” i.e., a collaborative frame-work wherein modelers and observers discuss results, problems, and new ideas, all with the goals of model improvement and better understanding of the Arctic climate system. Train a new generation of ocean and sea-ice observationalists and modelers continuing the practice of annual 1-2 day FAMOS workshop schools. Although the future focus of FAMOS projects will depend to a large degree on the interests of our participants, we envision that there will be three broad areas of interest related to model and ocean state (initial ocean and sea ice conditions) improvement, which is the overall goal of FAMOS. The first area includes the use of observations for model forcing (including initial and boundary conditions) and validation. Some of the recommended work associated with this was described in the AOMIP special JGR section (AOMIP-2007) and is related to data collections, gridding and validation for AOMIP/FAMOS purposes. Figure 1 Illustration of synthesis and integration activities employing a modeling approach. Figure explains this philosophy, where synthesis and integration among basic disciplines allows scientists to formulate a basic model, feed this model with initial and boundary conditions, and force it by integrating observational data. We improve models by employing the latest parameterizations of processes, compare models and their outputs, calibrate models and validate their results, and finally obtain advanced models to determine the most probable solutions with reduced uncertainties. The second area is model numerics and parameterization of different processes (e.g. mixing, advection, etc). An example is the introduction of the “Neptune” effect (Holloway, 2004; Holloway et al., 2007, Holloway et al., 2011), which is incorporated into several relatively coarse resolution models (e.g. Golubeva and Platov, 2007; Maqueda and Holloway, 2006; Wang et al., 2011) and has been shown to drive a “cyclonic rim current” around the Arctic basins (Proshutinsky et al., 2011). Numerical improvements include the introduction of second order moments based advection (e.g. Prather, 1986; Hofmann and Maqueda, 2006; Maqueda and Holloway, 2006; Holloway et al., 2007) and improved mixing (Zhang and Steele, 2007; Golubeva and Platov, 2007) in several models. These activities will be continued in other models and also expanded to implement new methods/algorithms/physics. The third area of model improvement will be the inclusion of processes important for the Arctic such as fast ice formation and break-up, tides and tidal and inertial ice dynamics. For example, preliminary experiments have shown that tidal and inertial sea-ice motion leads to additional generation of sea-ice mass and can improve mixing and allow heat release from the AW to the bottom of the ice (Holloway and Proshutinsky, 2007, Hibler et al., 2006, Chen et al., 2009). Model experiments with realistic forcing and tides are under design now and we expect that inclusion of tides will allow us to better understand their role in the dynamics and hydrographic structure of the Arctic Ocean.